Back in 2006 to 2008, the majority of mortgages that were issued by banks in Poland were denominated in the Swiss franc. And, most of the outstanding stock of Swiss franc mortgages was issued in that period. 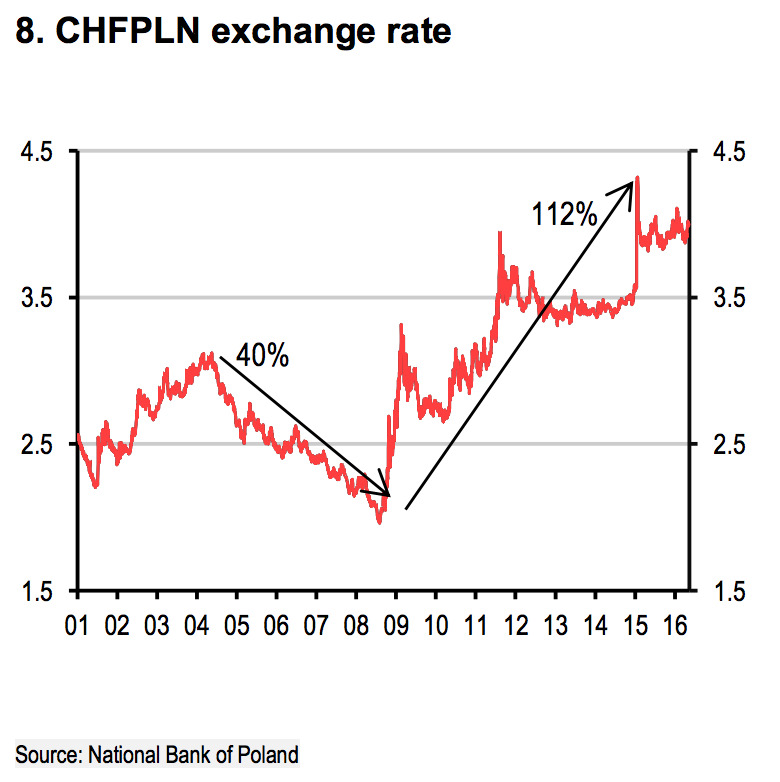 This was a popular thing to do because borrowers thought that the Polish zloty would continue to strengthen against the Swiss franc. At the time, the Polish currency had appreciated by about 30% against its Swiss counterpart. But then things reversed course in 2009. The Swiss franc has appreciated dramatically against the franc since then — which you can see in the chart of the exchange rate. 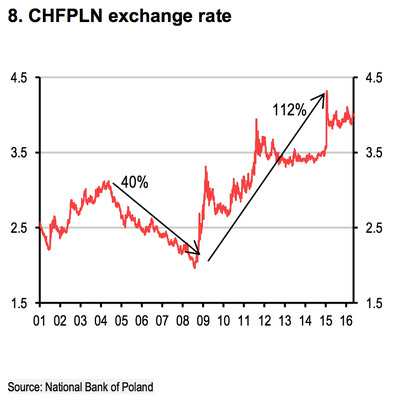 “As a result of the depreciation, we estimate that the value of an average PLN300,000- equivalent CHF mortgage issued between 2005 and 2008 was still 28% higher than its original in PLN value in 2015, even though 22% of the CHF principle would have been repaid,” HSBC’s Central Europe economist Agata Urbanska-Giner wrote in a note to clients back in May. In January, Polish president Andrzej Duda first presented a proposal for restructuring the Swiss franc mortgages. However, the country’s central bank criticised it, and the Financial Supervision Authority estimated that the terms could cost as much as 3.7% of GDP and would rattle the banking sector’s stability, according to Urbanska-Giner. And so, Duda put together a team of experts to fix the earlier draft. On Tuesday, they presented their new report to the president. However, details were pretty vague about the costs the banking sector will have to bare. Plus, there was no mention of methods for spreading the cost of restructuring over time. Given how little was disclosed yesterday, it looks like it will be only then that we are likely to get the details of the proposed solutions. The costs to banking sector stemming from the restructuring are key. At a press conference yesterday, the expert team put these at between PLN30-40bn based on their new proposals. This is less than the PKN67bn estimate by the banking supervision authority (KNF) that it attached to the January version of the CHF loans restructuring bill but still very high, more than three times the sector’s profit in 2015. Most importantly yesterday president’s experts argued that those costs could be spread over time, over 30 years. The questions as to whether this is possible remains open. In any case, these proposals are just the start. The polish president will reportedly draft legislation, which is expected to be presented by the end of June.